November to January- In winters the temperature drops down considerably. The pleasant climate in this season makes it an ideal time to visit this place. However, during night time the temperature drops down considerably. March to June- Summers here are very hot and humid, as the temperature rises up to 45°C. Quite high temperature during daytime can make it a bit difficult for you to stay outdoors for long time, but cool evenings are just ideal to move around the city. August to October- It is during the monsoon season when the rain blesses this place with greenery and it also drops down the temperature to a great extent. It is a good time for nature lovers to take pleasure of visiting numerous attractions located at this place. Very cold Weather in January is quite cold, accompanied by cool breeze. Skies are mostly clear with pleasant days and bright sunshine. Nights are comparatively cooler as mercury dips down after sunset. It is an ideal time to engage in outdoor activities and take up city tours to explore nearby attractions and various religious destinations that are spread along the stretch of this vibrant city. Pleasant February offers temperate weather with pleasant days and relatively cool nights. Light winds maintain coolness in the ambience, making the climate favorable for temple visits and various other outdoor tourist activities. Soothing weather allows tourists to travel across the city to explore its attractions. It is one of the ideal months to take up holiday packages to this place. Light warm clothes are suitable for nights. Moderately hot Temperature starts to rise from this month, but still falls under comfortable range. Sun shines for most of the days, resulting in mild hot weather during daytime. Nights are comparatively more pleasant. Moderate climate favors outdoor expeditions and travelling. One can take pleasure in sightseeing to explore this vibrant city, making it one of the best times to plan a visit here. Very hot April marks the advent of summers and temperature begins to soar. While nights can be somewhat pleasing, days are hot and uncomfortable. Accompanied by plenty of sunshine, warm and sweaty weather makes it a bit challenging for the vacationers to enjoy outings and travelling. Many outdoor activities are also hindered because of excessive heat. This period is not preferred for tourism. Very hot Being the hottest month of the year, May imposes extremely warm and harsh weather. Scorching heat and sweaty weather during daytime restricts outdoor trips and exciting tourist activities. However, the evenings are comparatively more comfortable and pleasant, allowing vacationers to plan short outdoor trips. For those planning a trip to Vaishali during this time, carrying sun protective gears is advisable. Rainy The month of June is tremendously hot. Although temperature scoops down to some extent, weather is still hot and is not favorable for tourist visits. Moreover, occurrence of rainfall because of monsoon hitting the city results in humid conditions, making the atmosphere inappropriate for travelling and engaging in other outdoor activities. It is, therefore, not a good time to plan a tourist visit here. Rainy The place continues to remain under the hold of monsoon. City experiences medium to heavy rainfall, often accompanied by thunderstorms. The sky is mostly cloudy, but there can be some days without rain. While weather during nights is a bit pleasing, temperature during daytime begins to fall under comfortable range. This period is good for those who prefer rain and want to explore the natural beauty of this place. Rainy The city receives plenty of rainfall in August, making it one of the wettest months of the year. The place becomes humid because of rains, which might cause annoyance to vacationers. Outdoor journeys and other tourist activities are restricted because of sultry weather. However, it can be a preferable time for nature lovers who can enjoy exploring scenic views of this vibrant city. Moderately hot Weather remains moderate during this month, offering appropriate climate for tourist visits. Days are moderately hot with clear skies and sunshine, while nights are comparatively more comfortable. 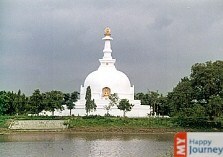 Temperature dips down to a comfortable level, favoring temple visits and sightseeing. Holidaymakers can take up city tours and travel across the region to explore places of interest. The natural beauty of the place is also worth watching in this post-monsoon period. Pleasant Weather becomes mild with the arrival of October. Days are pleasant with plenty of sunshine and nights are relatively cooler. Intermittent rainfall can be expected, while temperate weather allows the vacationers to enjoy outdoor activities and explore nearby attractions. Pilgrims can visit temples to pay homage to God. Offering hospitable climate, it is one of the best months to plan a trip to Vaishali. Moderately cold Temperature dips down slightly in the month of November, maintaining pleasant and fairly cool ambience. Days are pleasing with plenty of sunshine, favoring outings and sightseeing. Nights are relatively cold as mercury scoops down after sunset. Comfortable and soothing weather of this month is perfect for tourist visits. It is one of the ideal times to take up holiday packages to visit this city. Very cold Being one of the coldest months of the year, December offers cool ambience accompanied by gentle winds, making the weather suitable for tourist visits. Days are mild and cold while nights are chilly. Comfortable weather conditions make this period favorable for indulging in various tourist activities and enjoying temple visits. Due to high tourist season, the place is usually crowded with holidaymakers and pilgrims.